Officials with Vance County Schools awarded a total of 88 school volunteers and business partners with plaques and certificates during the school system’s annual Volunteer/Business Partner Recognition Reception held on April 25 at the Henderson Country Club. 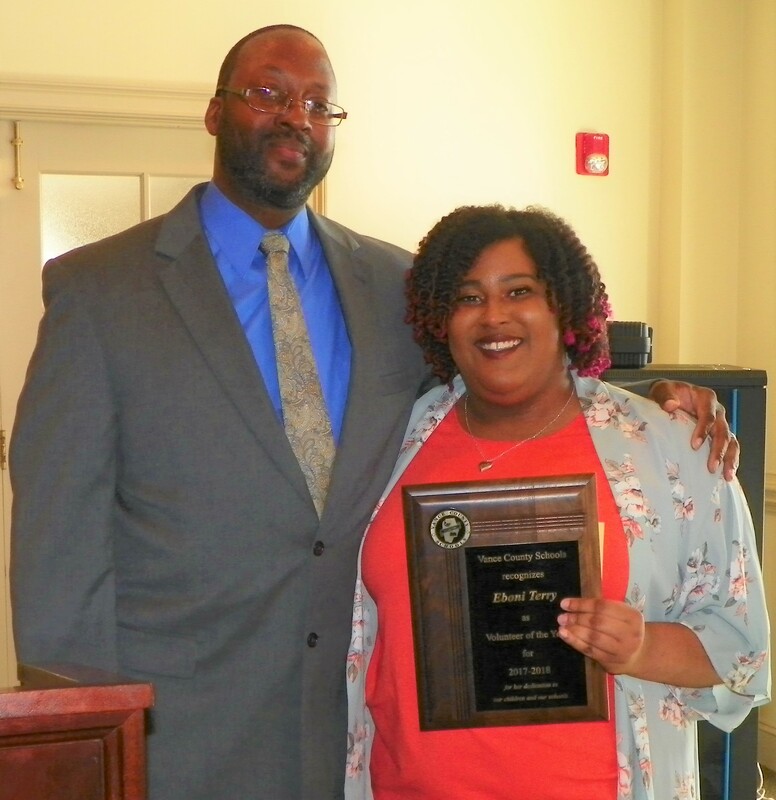 Principal Harold Thompson, Jr. of New Hope Elementary School, presented Eboni Terry with the plaque for her recognition as the school system’s Volunteer of the Year for the 2017-2018 school year. Terry was selected for the honor from an outstanding group of school volunteers who all earned their respective school’s Volunteer of the Year award. In addition to Terry, the school Volunteers of the Year include: Amanda Gill of Aycock Elementary; members of Cokesbury United Methodist Church and St. Paul’s United Church of Christ of Carver Elementary; Tamara Glover of Clarke Elementary; Yolanda Wilson of Dabney Elementary; Curtis Durham of Pinkston Street Elemenary; Woody and Sandra Woodland of E.M. Rollins Elementary; Amparo Villalobos of L.B. Yancey Elementary; members of Guided Start United Holy Church of E.O. Young, Jr. Elementary; Catherine Parham of Zeb Vance Elementary; Rev. John Miles and his Risen Faith Outreach Ministry of Eaton-Johnson Middle; Brenda Burton of Henderson Middle; Joanna Whittacre of STEM Early High; Sofia Miller-Ford of Early College High; members of Central Baptist Church of Northern Vance High; and Fanta Terry of Southern Vance High. The members of Clearview Baptist Church again were recognized as the top business partners for the current school year. The church actually received the Shining Moment Award in late January at the Henderson-Vance Chamber of Commerce Annual Banquet. Other top business partners honored were First Baptist Church, First United Methodist Church, Flat Rock United Methodist Church, Henderson Family YMCA, Henderson-Vance Recreation and Parks, Kiwanis Club of Henderson, Mazatlan Restaurant, MiLibroHispano.org, Optimist Club of Henderson, The Science House at N.C. State University; Townsville Lions Club, Toyota of Henderson, Versatrim and Zeb Vance Ruritan Club. Each recipient received their award from Superintendent Anthony Jackson and Vance County Board of Education members Darlynn Oxendine, chairperson, and Edward Wilson. Students in the fifth-grade chorus at E.M. Rollins Elementary School, under the direction of music teacher Cindy Edwards, performed for the approximately 150 people attending the recognition reception. Image Information: Eboni Terry holds the plaque she received as the Vance County Schools Volunteer of the Year for 2017-2018 after it was presented to her by Principal Harold Thompson, Jr., of New Hope Elementary School, left.